Looking for the best ​mosquito coils to help you get rid of mosquitoes? Great, you're in the right place! ​What is a mosquito coil? ​How does a mosquito coil work? ​How to use mosquito coils? ​There can be a spectrum of solutions in getting rid of mosquitoes. The use of mosquito coils is one of them, wherein you can enjoy your planned activities, day in day out without getting bombarded with mosquito bites. With that, our top picks goes to the SC Johnson Patio & Deck Mosquito Coils. ​These mosquito coils are 100% effective in keeping ​bloodsuckers at bay without the irritating smell. ​Most mosquito coils give off a rather unpleasant smell that can be very irritating to the entire family. Worse, smoke coming from mosquito coils can trigger respiratory allergic reactions. Off ​Deck & Patio Mosquito Coils by SC Johnson has a country fresh scent homeowners will surely love. It provides a 10 X 10 ft protection against those nasty mosquitoes so the coil can be a good companion in enjoying a warm cup of coffee while reading the day's broadsheet on the patio. Continue reading for our full breakdown and more information on mosquito coils! Check out our below list for a summary of our results. Keep on reading to learn more about mosquito coils! ​A mosquito coil is a special type of mosquito repelling solution made from dried pyrethrum powder. As its name implies, a mosquito coil is a spiral that burns slowly when lit. The smoke produced by the slowly burning coil is an effective mosquito repellent. The coil is suspended in the air by a mosquito coil holder to keep it burning all throughout. Mosquito coils are usually 4 to 6 inches in diameter and can last within 4 to 7 hours. This special type of repellent in is common in countries in the tropical and sub-tropical countries where there is a warm and humid environment. ​Basically, there are two types of mosquito coils with regards to their main function. 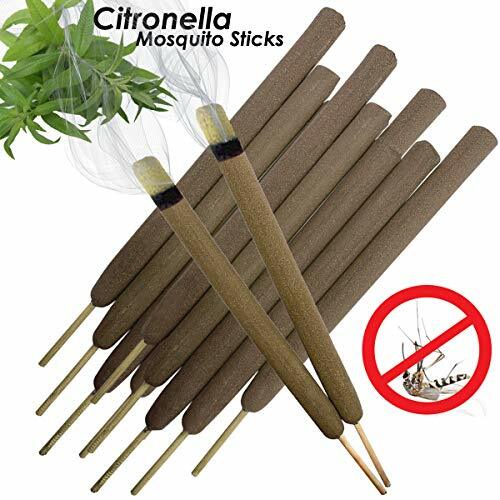 Mosquito coils formulated with an insecticide produce an incense smoke that can knock mosquitoes down effectively. On the other hand, coils formulated with an essential oil extract such as citronella deliver a repelling effect against mosquitoes. Mosquito coils are often used with holder to suspend it horizontally in the air. The outer end is then lit, burning the incense slowly from the outside of the spiral towards its core. The smoke produced by the burning coil either knocks the mosquitoes down or repels them. Depending on the wind condition of the environment, mosquito coils can cover an area of up to 100 square feet. As mentioned earlier, there are two types of coils based on its content. ​A coil formulated with insecticides has the capability of killing or knocking mosquitoes down. However, the downside of such coil is that it gives off a rather strong and irritating scent that can be very unpleasant. The second type of mosquito coil is made of a plant-derived ingredient such as citronella extract. But unlike the former, this new type of coil is more a repellent than a mosquito killing incense. ​Smoke produced from burning mosquito coil is indeed in killing and repelling mosquitoes. But does it pose a risk on human health? Recent studies have shown that being smoke coming from a single mosquito coil is equivalent to that produced by 75-137 cigarettes. And such risk is increased if mosquito coils are used indoors to eliminate blood sucking insects that have penetrated into the house. This is definitely the main reason why mosquito coils are recommended for outdoor use. In some cases, mosquito coils are used inside the house but it is best to first make sure that the area is well ventilated. ​In most cases, mosquito coils are paired together in packaging. You should be very careful in separating the two since mosquito coils are fragile and may easily break. The technique is to loosen the two coils from the center and slowly working your way outwards. Most mosquito coil packages come with a coil holder or stand to suspend the coil in the air. Raise the center part of the holder and insert it into the preshaped slot of the coil. ​Light the tip of the coil and secure it on a metallic plate to collect the ash. Place the burning coil on your patio, yard, or garden to kill or eliminate mosquitoes. Make sure that you position the coil away from highly flammable materials of your house. The following video will take you deep into the manufacturing process of mosquito coils. If you do think you have a serious case of mosquito infestation, we highly recommend first consulting with a local exterminator before using sprays or any other method of mosquito control. Improper use can and will make your mosquito problem worse. Use our local exterminator search tool to get a couple free quotes so you can begin the removal process. If you want to truly enjoy a relaxing time on your porch or yard, ​mosquito coils can be a reliable companion. If you already have ​a serious case of mosquito infestation, our recommendation would be to get professional help on the level of your infestation. Let's get into our top picks! 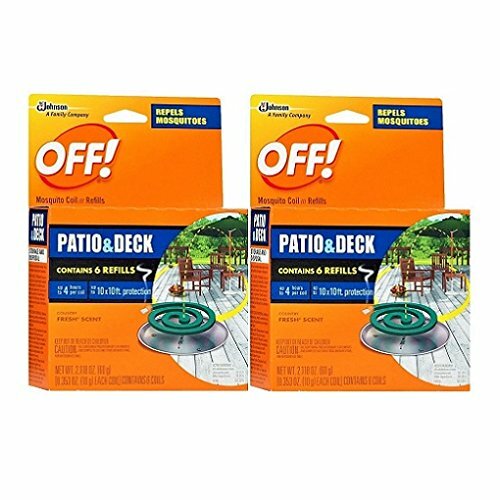 ​Made of 0.15% D/L-Allethrolene D -Trans Chrysanthemate, these coils are very much effective in keeping mosquitoes at bay as you enjoy a refreshing and relaxing time on your patio or garden. ​This package is composed of 2 packs with 12 coils in all. Each coil can last up to 4 hours of slow and continuous burning. The smoke of the coil can provide protection over a 10x10 ft area. ​This mosquito solution is most effective when used on semi-confined areas of your home where there is minimal air movement. 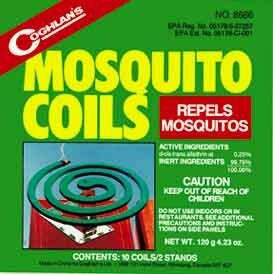 What's best is that these coils have been proven to repel mosquitoes that can cause West Nile Virus. ​Coming in for a close second is a coil carrying the same brand as our number pick. 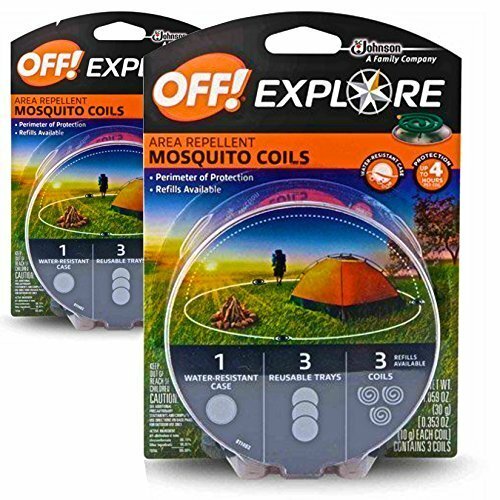 True to its name, Off Explore is a mosquito solution perfect in exploring the great outdoors. ​It also provides superior protection over a 10x10 ft area and can last for four straight hours. The bundle is comprised of two packs, each containing three coils, three reusable trays, and a water resistant case. ​The only setback in using these coils is that it smells bad. So make sure that you use them only in an outdoor setting. ​Earning the third spot is another peaceful companion for all your outdoor escapades and even just for taking a relaxing nap on your porch or patio. ​It contains 0.60% pyrethrin and can help repel mosquitoes that may transmit Zika Virus. Use these coils in an area with little or no breeze and you'll have a smoke barrier that can help you get undisturbed sleep. ​You can also use these coils inside your car. Just make sure that the windows are open and you secure the coil with with its stand and a metallic tray. ​This coil is strictly for outdoor use only since it contains the active ingredient pyrethrin and produces a great deal of smoke. ​An EPA approved product, this W4W mosquito coil is perfect in protecting the entire family from those pesky mosquitoes while enjoying a great barbecue in the garden or while taking a nap on the porch or patio. ​This bundle is composed of 5 packs with 4 coils and 2 metal stands inside each pack. 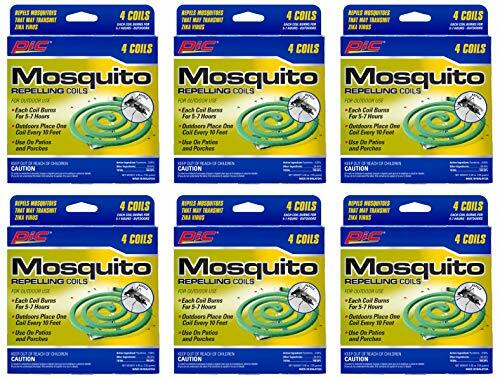 With a total of 20 mosquito coils in all, you get a great deal for less than $13. ​These coils are also a good alternative whenever you go out camping. Simply position 3 to 4 coils along the perimeter of your tent, 10 feet apart. ​Compared to the rest of the entries in this list, Coghlan's Mosquito Coils last the longest. One coil can last for up to 8 full hours. If you easily cut the burning end to preserve the coil for later use. However, you have to be very gentle in preparing the coils. The spirals are very fragile and are interlocked with each other. If you are a little careless, the coils could easily end up into broken sections. Like any other mosquito coil, it gives off a rather unpleasant scent which is why it recommended strictly for outdoor use. ​The coils contain 0.25% allethrin. ​All of the coils in our list are very much effective in keeping mosquitoes at bay whenever you feel like enjoying a cup of coffee on your patio in a fine afternoon. However, our top pick is the Patio and Deck Coils by SC Johnson. Although it lasts for only 4 hours, it packs a power punch formula than can easily knock mosquitoes down. Furthermore, it gives off a country fresh scent making it very friendly to anyone's nose. Please Note*** If you are attempting to kill or remove a ​mosquito infestation problem, we highly recommend you consult and potentially hire a licensed exterminator or else you risk making your problem worse. Click here for our tool to help you find free quotes from pre-qualified exterminators in your area.